Okayama City, the capital of Okayama Prefecture, has a population of approximately 620,000. It is one of the major commercial, educational, and cultural centers of the Chugoku-Shikoku region in Japan, and has many historical sights and tourist areas such as Korakuen Garden, Okayama Castle, and Kibitsu Shrine. Okayama City has a convenient transportation network linked with other areas of Japan. There are direct flights to Tokyo, Kagoshima, Okinawa, Sapporo, and even Seoul, Korea. By the Super Express Train (shinkansen) , Okayama is about three hours from Tokyo and one hour from Shin-Osaka. 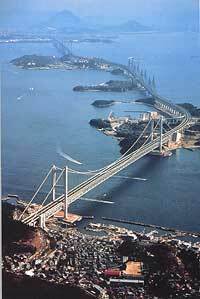 Seto Ohashi Bridge, opened in April 1988, directly connects the main islands of Honshu and Shikoku. From Takamatsu, it takes about one hour via Seto Ohashi Bridge by train (Marine Liner). Seto Ohashi Bridge is composed of six bridges with total length of 9,368m, and is the longest double-decked bridge in the world. Okayama University consists of four campuses: Tsushima, Shikata, Kurashiki, and Misasa Campus. Tsushima Campus, the main campus of the University, is located at the northern part of Okayam City. It takes about l0 minutes from Okayama Station by bus. Shikata Campus is situated at the southern part of Okayama City while Kurashiki Campus is located in Kurashiki City, Okayama Prefecture , LED display known traditionally as the Kurashiki "Beautifull Zone", with rows of white-walled store houses. Misasa Campus is located at Misasa-Cho in Tottori Prefecture, Which is famous for its hot springs.